BlackPeopleMeet.com was founded in 2002 and was created to provide a dating site catered to the needs of African Americans. The site has a thousand new members every month and despite the fact that it has been developed for black singles, BlackPeopleMeet.com accepts other nationalities from all walks of life for as long as one is at least 18 years old. This dating website aims to promote black singles who are interested in meeting other black singles with the purpose of friendship, dating, or activity partnership by becoming long distance pals. It has a user-friendly interface. The site's target demographics are the black singles of all sexual preferences: straight, gay, lesbian or bisexual. They may be single, divorced, widowed, or in a relationship. The site is also open to those who are not black but are willing to meet someone who is. BlackPeopleMeet.com has gained about four percent of the total number of black population residing in America and is considered as the largest dating site for black men and women online. With millions of members in its database, this highly reputable website gains the trust of its users which makes it successful in this particular niche. Single black men and women in BlackPeopleMeet.com come from various backgrounds and locations. The gender ratio of having more females than males is common in dating sites. Members who use the site for free can browse the website and use the various features. Just like other members, they complete their profile, view other's profile and save the profiles of those who catch their interest. However, free members cannot send instant messages to other members. Oftentimes, members would want to try the features first before they decide on paying for membership. Out of curiosity or for fun, BlackPeopleMeet.com users are free to try the site before they purchase monthly or in a longer term of 3 or 6 months. Those who have decided on a longer-term paid subscription packages can save as compared with monthly memberships. Paying members can choose to pay through their credit cards (Visa, MasterCard, Amex or Discover), PayPal or Mail-In Order. Popularity. BlackPeopleMeet.com is extremely popular being the largest African American dating site. With more than 1000 new users every month and with over a million members and visitors visiting the site per month, there is no doubt that this site can give you a great avenue to find a partner. Privacy. The members' personal information and conversations are never shared for public viewing. BlackPeopleMeet.com emphasizes its members' privacy and security. Membership Fee. While a member can use free membership, it is almost not practical to stay in a dating site if you couldn't send a message to the members you like. So, one needs to spend to enjoy the site's features especially the communication tools which are essential in finding the partner of one's dreams. Limited matching system. Other dating sites offer a more comprehensive matching system but not BlackPeopleMeet.com. However, you can still browse for the type of members that you want to meet. 1Inbox/Communication tools. The Inbox tab features the following: Messages, Favorites, Flirts, Likes & Comments, and Yeses to Me. However, only members with paid membership status can access the Inbox feature. Among the communication tools or services included in a paid membership are sending and reading unlimited messages, viewing flirt messages, viewing video greetings, and chatting through text, audio or video. Who's Viewed Me. Users can see who has viewed them since the last time they have logged in. This option also features who has sent them Faves, Flirts and Likes. It also shows the members that the users have viewed. Search. This search tab shows all the members with their picture, username, age and location. Username.Users who search for a specific or similar username can use this search option. Online Now. Provides search results of people who are currently online at the time of searching and can be filtered according to their age bracket as well as the viewing preference which can be either in Thumbnails or Gallery. Keyword. Search according to keywords and filter them according to their age bracket, distance, or within a certain zip code. "Today's Matches".This section shows the user pictures of members together with a few basic information such as their username and address. They will be shown one at a time. If a user sees someone who catches his or her interest, the Chat button is used to easily send an instant message to the member. This feature also shows 'Today's Matches'. Tokens/Virtual Gifts. In this tab, the users need to purchase tokens so that they can make use of some add-ons such as the Notify Me (informs the user when a specific member logs in during the next 7 days and the site informs them that the user is waiting); PromoteMe (put the user on top of the search results); and Virtual Gifts (send gifts to other members). Echo in Messaging. BlackPeopleMeet.com has the "Echo" feature in its messaging tool that allows the users to identify the messages that come from people the user has initiated contact in the past 30 days. Advanced Search. While the search options allow multi-selection, paid users can also view the profiles of members who have logged in within a specific number of days in the 'most recent activity'. This also holds true to new members/profiles. Signing up to join the site is an extremely easy process. Just answer a few questions, search for the type of person and the site shows potential matches. 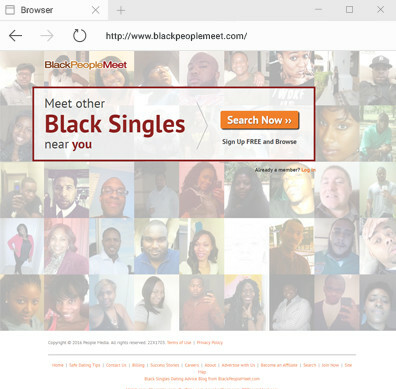 Unlike other dating sites, BlackPeopleMeet.com doesn't have a comprehensive matching system so members search manually by browsing profiles of other members. With a niche catering the needs of black singles, BlackPeopleMeet.com has a very high success rate being the top dating site for African American singles and those who are searching for them. The site's large user base gives more chances for their members to find their perfect match. BlackPeopleMeet.com emphasizes the importance of safety and privacy for its members. With a rating of 4.2/5, the members feel secured in this dating site and its commitment to this is shown by the way they have developed the security features in the website and the way they publish reminder articles on safety tips both for dating and for protection from website fraud. With a basic layout, BlackPeopleMeet.com provides a simple user-friendly interface for an efficient user experience. There are navigation bars located at the left and at the top making it easier for the users to move from one page to another. Oftentimes, they are excited to view the day's matches or to check their inbox messages. Its search functions include the a few options including sorting members by age, gender or location. Aside from that, the site's advanced capabilities allow users to search for specific marital status, zodiac sign or relationship expectations. The site's Help page is available to respond to the most frequently asked questions and it also provides various categories of support that users may need. BlackPeopleMeet.com is the largest online dating site for African-Americans or black singles and has earned reputation for being one of the trusted dating sites in this niche. It is easy to navigate and the membership prices are affordable. This site is great for those who are interested in meeting various black singles whether for friendship, romance or activity partnership.